What is this mint family plant? http://ucanr.edu/sites/poisonous_safe_plants/Toxic_Plants_by_Scientific_Name_685/ is poorly done, containing numerous errors. For example, they call deadly nightshade a Solanum species. 2ndly, they call black nightshade being majorly toxic (not only has the myth been disproven by people [e.g., author Sam Thayer's], but if it were true I and my little kids would be dead many times over. If it is wrong on those accounts, hopefully it wasn’t wrong by saying something is safe that isn’t. I’m guessing they just made a chart using 3rd hand info., which is the opposite of how universities usually gather info. Of course their mushrooms section was even worse…. I’ve skimmed Sam Thayer’s new book. I’m encouraged to try poke. My poke shoots have no purple. Thinking about our plant conversations, I sampled a little and noticed no burning, bitter, or otherwise negative effects in my mouth. Are we to say that its toxins are so mildly flavored that that they can’t be detected? I’ve tasted poke seeds before and they had a strong burning sensation. It just seems to me that if we can’t detect the toxins, then they are negligible. I realize that is an assumption based on other plant experiences. But if I go with that assumption, then I would think it’s fine to eat them raw. If I boil them and allow taste to determine if they’re boiled enough, then what I have here would not even require cooking, or only enough for textural preferences. Thoughts? Generalizing is a way in which humans navigate the many complexities of the world. We essentially cluster knowledge across a group of what we deem similar, and then apply that knowledge on a broader scale to what else appears similar. Generalizations generally keep us safe. -friend_). A more specific statement than the above quoted could read: "Don’t eat anything not from a trusted source, unless you are truly (not arrogantly) confident in its identity and edibility". Once a person decides to go down the road of identifying and trying their foraged foods we reach another layer of generalizing. Such a person might only forage for plants and not mushrooms, saying "mushrooms are too dangerous". It is true many mushrooms are very difficult to ID to the species. However, there are many mushrooms that are just as easy as the easiest of plants (of which it is always possible to be too careless and mistake a green potato fruit for a green tomato) to determine safety, such as giant puffballs. Generalizers are those who seek out the easiest mushrooms, use a general rule, and then proceed to eat all they find that fits the general rule. Generalizer morel hunters, for example, learn the characteristics of morels, learn to distinguish them from false morels, and then consume lots of different morels w/o certainty about species. Particularizer morel hunters will only consume those they believe they have identified to the species. Ironically, Particularizers, such as Particularizer King Bolete eaters, often end up not knowing what species they are really eating because they are going after a complex (cluster of closely related species). It is another generalization to say "mushrooms are most healthful if eaten cooked". It is another rule that keeps us safe from problems such as acute harm of those toxic w/o cooking, long-term increased risk* (not guaranteed cancer, thus someone may consume lots of raw mushrooms for 80 years and be fine) of cancer (numerous journal articles do cite issues with eating certain common raw mushrooms), the possibility of harmful bacteria existing on the mushroom (such as Listeria monocytogenes, which is found on soil [amongst other things] and can cause a very dangerous infection for fetuses [http://en.wikipedia.org/wiki/Listeriosis]). We will return to the question of cooking later. To return to the tree of generalizing and particularizing, another deeper layer emerges: Some people say: "I will only eat edibles I identify to the species, but never Amanitas". We have here another method of staying safe with mushrooming, not because only Amanitas are deadly, but because Amanitas are leading causes of mushroom deaths due to having both deadly and difficult to identify species that can be confused to the untrained and semi-trained eye (an especially difficult issue is when someone comes from one region only to find another mushroom in a new region that looks like what they’re used to eating, such as mistaking Amanita phalloides [deadly] for Amanita manginiana (edible). Yet there are also people who eat Amanitas safely for decades, despite others’ strong disapproval. Are they wreckless and lucky (true wreckless amanita eating, especially done often & w/o extreme luck, will likely eventually lead to death)? For the most part, they are people who have simply learned what is edible and what it toxic. These people have extensively Particularized down to species of a vast array of genera. But what if we particularize instead of generalize about raw mushrooms? *Assuming no other components are not one day found that reduce risk of cancer equally or more than the carcinogenic compounds do. (I just found this in my drafts from long long ago, and never sent. I’m keeping all the people it was meant for to get it, even if I don’t recall why I included each particular person). 1. The taste reminded me of a skunk (yuck!). 2. It produced sensations on the tip of my tongue where it must touched that felt like tiny needles hitting me. These were raphides, practically unaffected by the drying. I knew T. Abe Llyod had experimented with Western Skunk Cabbage, a different plant that may be more similar than we know to Eastern Skunk Cabbage. His post shows w/two changes of water, the boiled plant’s young sections were rendered edible w/only a slight ill effect. Now, I’m someone who’s not yet found an evening primrose I can eat w/o it bothering me quite a bit. I’m sensitive to raphides, I’ve found. So, I expect what Abe could eat that way, I’d not as likely do well with. This year I wanted to know what would happen if I tried to make a broth out of the leaves. 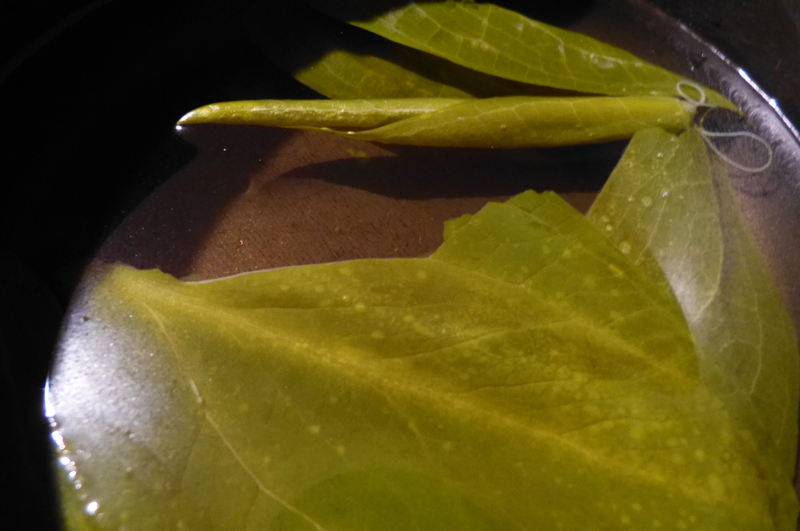 I took some half-unfurled leaves and boiled them. I went to smell the broth, afraid of how skunky it would be, but it wasn’t even slightly skunky! In fact, the bad odor was replaced by only pleasant odor, and a sip of the broth led to surprise: It was mild (not a lot of leaves, you see), but did have some nice flavor. My wife tried a bit and agreed it was flavorful. I found sipping the broth led to no ill effect. I then tasted tiny pieces of the leaves w/o ill effect. 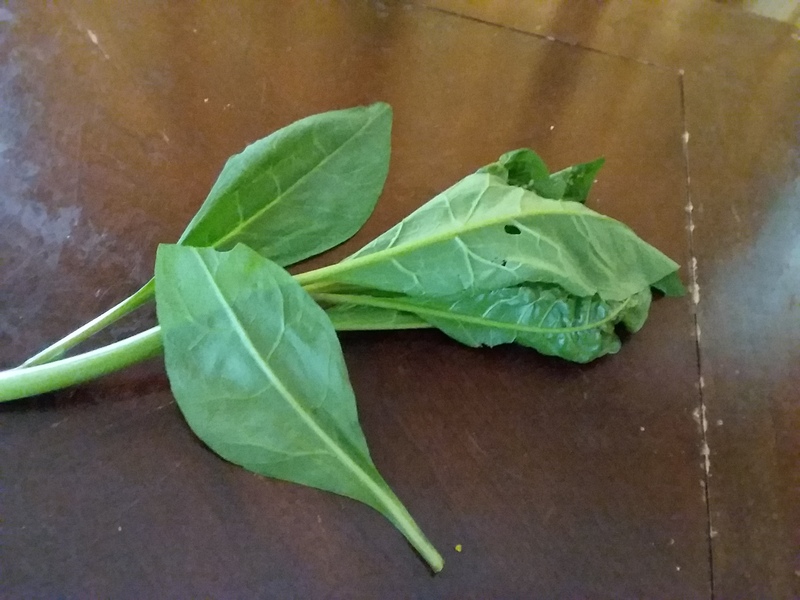 I go on the internet to research boiled Eastern Skunk Cabbage, and found JJ Murphy boiled unfurled leaves and found them to have a sting. But too much boiling can reduce how well they stay together. I then saw he consulted w/a couple authors, and that now it is being written that dozens of people ate the leaves boiled in changes of water for stuffed skunk cabbage [leaves]. Much more literature has appeared about boiling them since my drying experiment. It seems the best thing to do w/them for edibility is to boil enough to make safe, but not too much that they lose their flavor and durability.